Bath Amenities: Our all natural bath amenities include hand soap, body wash, shampoo and conditioner. Black sand/pebble beach. Gorgeous views. Not suitable for swimming. We do have phone in the room with free local calling. If you plan on making long distance calls, please bring an 800# calling card. The best provider of cell phone service in Hana, Maui is Verizon. Available at checkin area. $10 / load. We supply biodegradable soap. Free off street parking. 1 stall per unit. free of charge, while staying with us. fully equipped kitchen and service for 6 including wine glasses, etc. to enjoy the beautiful view and the soothing sound of the ocean. *Please note* Our unit is NOT equipped with Televisions or Air Conditioning. We have cooling Tradewinds and in their absence, ceiling fans for your comfort. Housekeeping: Our friendly housekeeping staff will perform daily housekeeping service to tidy your room, refresh linens, make your bed, empty trash and replenish amenities. Accessibility: Our buildings are not equipped with elevators. We have ground floor (0 – 3 steps) or 2nd floor accommodations (1/2 – 1 flight of stairs). If you have physical limitations, please inquire with our office staff for assistance. 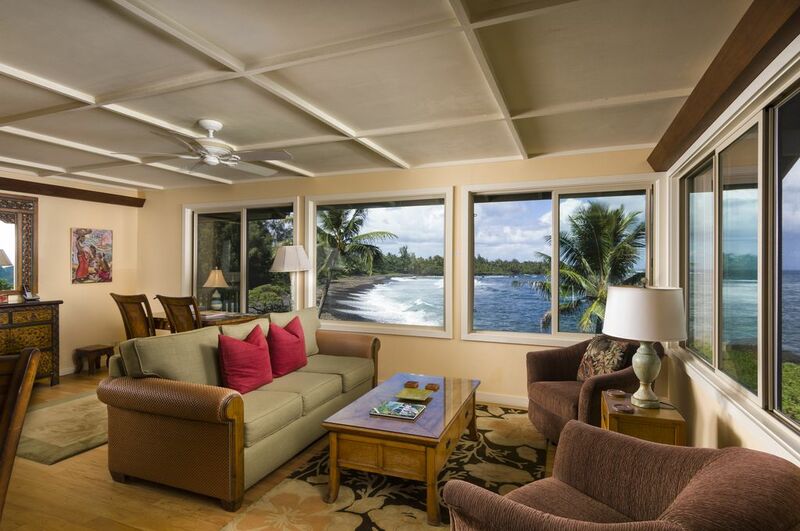 We loved our stay at the Hana Kai. I would love to return and spend more time there. The condo is better than pictures. Loved watching the sunrise. A perfect location to explore Hana. Thank you hope to return soon. This condo is amazing. We could sit outside during a rainstorm under the covered porch. Just a very relaxing place to be. Amazing and felt like home. Nice in all respects. One suggestion--hang a curtain or shutter on the wall opening between the master bedroom and bath--it's a little surprising to see your partner sitting on the toilet when you walk by. This place is absolutely beautiful! I would highly recommend it. Groceries: There are 2 small convenience stores in Hana that carry all the basics and more. There are several fruit stands along the Hana Highway and in Hana selling organically grown fruits, produce and some prepared foods such as banana bread and preserves. Local fishermen sometimes sell their deep-sea catch along the roadside at reasonable prices (they will fillet them for you). Emergency & Medical services: These are available through Hana Health Center located 1/2 mile from Hana Kai, open daily Mon-Fri. Emergency Ambulatory, Fire, Rescue and Police are also available 24/7. Weather: Hana is located in one of the last pristine rainforests in Hawaii and it takes a bit of rain to keep it so lush and green. We sometimes experience passing showers (blessings) and some days are more blessed than others…a light rain poncho or a small umbrella may come in handy. Enjoy the beautiful waterfalls on the Hana Highway, but approach them with caution and heed any posted warning signs as flash flooding can occur especially after high rainfall on the mountain. Activities: Our reservation staff will be happy to assist you with the many activities and attractions around Hana including: Horseback riding, nature hiking, beaches, massage, dining, touring Hana’s Cultural Center or Kahanu Gardens where the islands’ largest heiau (temple) has been restored to its original magnificence.